It is hard to imagine what a big part of American life the passenger pigeon once was. By some estimates it made up 25 to 40 percent of all the birds on the continent. The Native American Seneca tribe viewed the bird as a gift from the gods because they were so abundant. There are 13 towns named after them in Illinois alone. When Charles Dickens traveled to the states, we fed him passenger pigeon. But in just a few decades the bird vanished. On the 100th anniversary of its extinction, I wanted to understand how a bird could go from being the most plentiful bird in North America to non-existence. So I met naturalist Joel Greenberg at his house just outside Chicago. Greenberg is perhaps this species’ biggest fan. A stuffed bird named Heinrich sits on Greenberg’s kitchen table and a bumper sticker on his car says “ask me about my passenger pigeon.” He authored the book, A Feathered River Across The Sky, The Passenger Pigeon’s Flight to Extinction. Greenberg must encounter a lot of misunderstandings, because he wants to make it absolutely clear that Heinrich is not the same kind of pigeon you see flying around the city, nor is he a carrier pigeon. Instead Heinrich has a shimmery pink breast, and bluish back. He is a pretty bird. But what made this species really special—the thing I find almost incomprehensible—is the huge numbers of them that flew together. The birds did not just travel over forests and fields. They also flew over big cities like Chicago, turning buildings white with their poop. Greenberg recounts a famous story from Columbus, Ohio in the 1850s. So how does a species go from an estimated billions to non-existence? Humans hunted the passenger pigeon for many years and some of the methods were downright strange. Greenberg says some people filled a clay pot with sulfur, set it on fire and placed it under nesting birds. The birds would topple out of the trees. Greenberg says one commenter observed this method was good for the ladies, because it didn’t involve too much exertion or guns. Some farmers in Ontario kept it more simple: when the birds flew over their fields, they just threw potatoes at them. “Now it’s good to know they lost more potatoes than they got pigeons, but every so often a pigeon would fall and you’d have most of a stew fall at your feet,” Greenberg said. 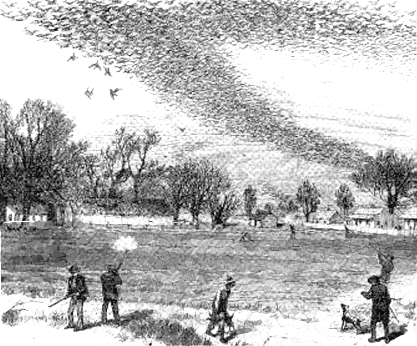 The pigeons were also used in shooting tournaments. One trap, called a plunge shooter, would catapult live birds into the air. According to Greenberg, sometimes people blinded the pigeon, or ripped out feathers and put cayenne on their skin to make the bird fly in circles. Chicago was a major center for shoots and Captain Bogardus, one of the most famous shooters, was from Illinois. He was said to have shot 500 birds in a single practice session, just to stay sharp. But Greenberg says the real tipping point for the birds was the growth of two new technologies: the telegraph and the train. The birds often nested in huge groups. The telegraph made it easy to spread word of the nesting locations and attracted big crowds of hunters—some working full time to track the bird. With the growth of railroads the meat could be shipped to city markets, where newly industrialized communities were hungry for cheap meat. The birds flew so closely together that a single shot could kill multiple birds. But even more efficient were net traps. Hunters would attract birds using a live decoy—blinded and tied to a stool—hence the term stool pigeon. “With a single release of the net they could catch hundreds of birds, sometimes 1,200 or 1,300 at a time,” Greenberg explained. One newspaper from the time reported 7.2 million bird carcasses were shipped from a single nesting site, which gives you an idea of how plentiful they were. But Greenberg believes the bird usually laid only about one egg a year, and now those nestings were regularly disrupted. The massive killings caught up with them. People started to notice that it was harder to find the bird in the wild and eventually impossible. “People had so much trouble trying to wrap their minds around how it could disappear,” Greenberg said. They came up with all kinds of theories to explain why it wasn’t human’s fault, like that the birds moved to South America and changed their appearance. Greenberg says he worries he’s seeing a similar reaction now. It feels insensitive to ask, but it’s hard not to wonder why the death of a species—no matter how fascinating—should matter to the general population. Greenberg says other species have a right to exist, and it’s immoral to prioritize their worth on human’s needs alone. But he also says there completely selfish reasons to preserve a species. He points to an analogy from Paul and Anne Ehrlich’s book, Extinction: The Causes and Consequences of the Disappearance of Species. The day after I meet Greenberg planes criss-cross Chicago for the Air and Water Show. Like flocks of pigeons they fill the sky with a roar. You can even hear it inside the Peggy Notebaert Nature Museum where I meet ecologist Steve Sullivan. “This being the anniversary of the passenger pigeon we talk a lot about the pigeon," Sullivan said. "But this story repeats itself again and again." The museum has an exhibit called, “Nature&apos;s Struggle: Survival and Extinction.” The exhibit starts by showing what Illinois would have been like over a hundred years ago. Passenger pigeons fill the sky, but there are also more rattlesnakes, bears and beavers. I ask Sullivan what animal is the passenger pigeon of today and he mentions monarch butterflies. Like the passenger pigeon, most of us think of it as common and plentiful. But because of a range of factors, including herbicides that kill their favorite food source of milkweed, the monarch’s numbers are plummeting. In the museum’s butterfly conservation lab, Sullivan leaned over and pointed inside paper cups. “Oh look you can see a couple of caterpillars that are crawling up towards the top of their little enclosures,” he said. There are no monarchs today, instead they are raising silvery checkerspots. Eventually the museum will release these butterflies into the wild to help boost their population. Sullivan says you can track conservation efforts like this one back to the passenger pigeon. Despite all the wild theories, many people ended up acknowledging that humans drove that extinction. It was a big moment in history, one of the first times the general public realized they could have a huge and permanent impact on nature. It launched a conservation movement and led to early environmental legislation. That gives Sullivan hope. He says beavers, otters, and even white tailed deer were at one time extirpated (in other words, locally extinct). But once we realized the harm we could do, we used conservation efforts to bring such animals back. 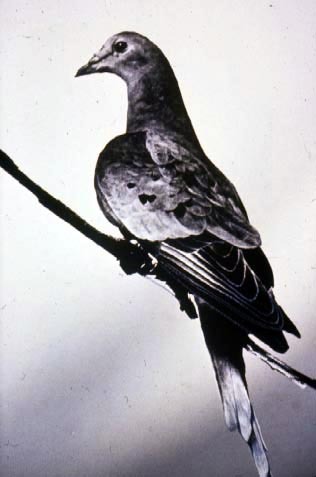 One of the reasons the passenger pigeon story was so motivating is because we actually knew about the very last bird. “It’s rare that we know with virtual certainty the hour and day that a species ceases to exist,” Greenberg said. That last bird’s name was Martha. Unlike her ancestors, Martha didn’t spend her days migrating across the country. The only time she ever flew was first class on a plane. She most likely came from a captive flock in Chicago’s Hyde Park. It was the only group ever studied by scientists. If you’ve seen a photo of a pigeon in captivity, it was probably one of them. Martha was sent to the Cincinnati Zoo. As the species became more rare, huge prizes were offered to find the bird. But it was too late. Martha eventually became the last of her kind. As she grew older, she became slow and still. The zoo moved her perch lower, so she could reach it. “There is a story on weekends that big crowds would throw sand on her to get her to move,” Greenberg said. Martha died 100 years ago on September 1. The zoo froze her body in a 300-pound of block of ice and mailed her to the Smithsonian. Martha lived her last years alone. Pigeons were famous for traveling in gigantic groups, but John James Audubon remembers seeing one flying through the forest by itself. It moved quickly, darting through trees. Audubon says it passed like a thought.